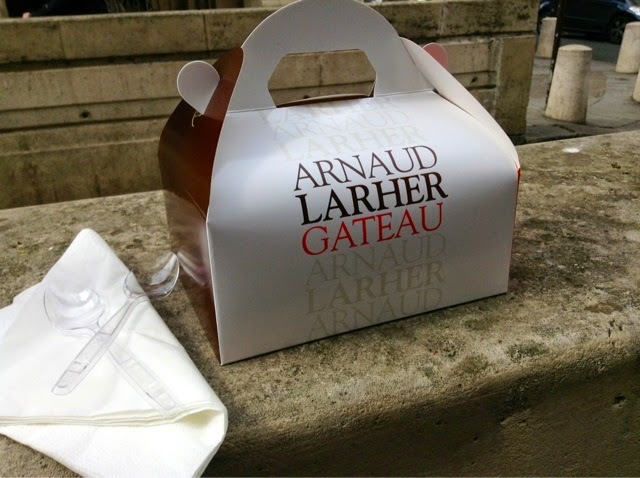 Solli and I went back (2nd time) to Arnaud Larher on 93, rue de Seine. 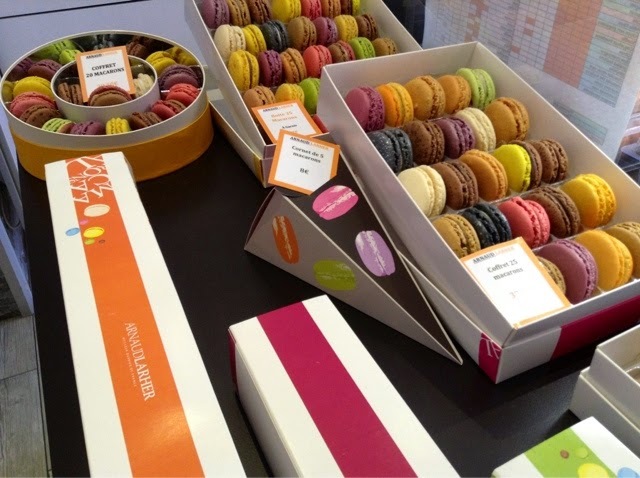 Yesterday we were getting Jour du macarons. Looking over the gorgeous desserts.. It seemed like a good idea to try one out. This citrus cheese cake looked tempting. 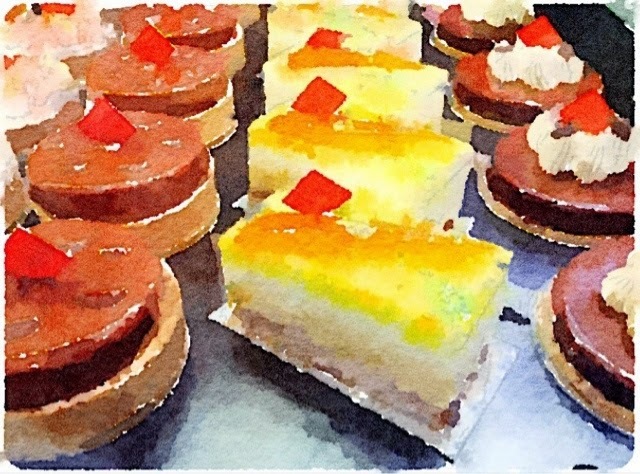 Have you tried the amazing app Waterlogue? It turns any photo uploaded into a quasi-watercolor look. 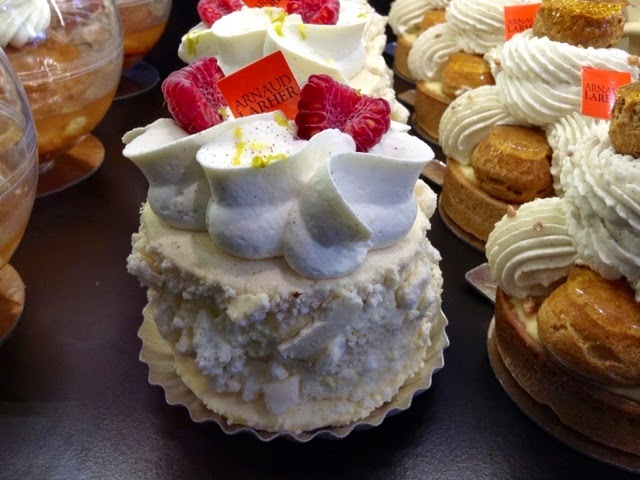 We decided on this meringue concoction layered with Chantilly whipped cream, a bit of raspberry inside and a hint of citron vert - very light, delicate and delicious. 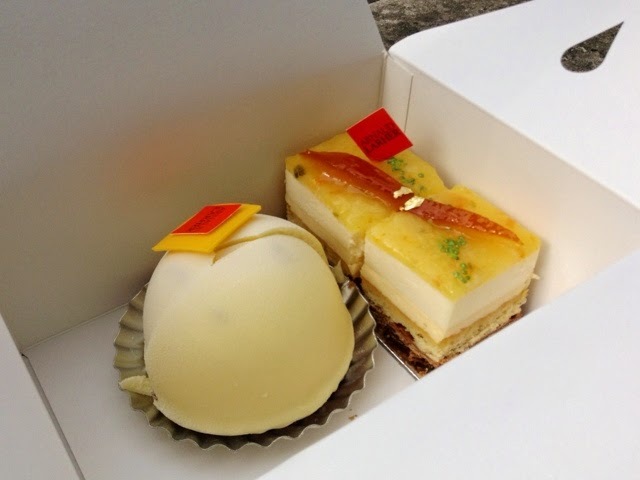 We returned today with plans to try 2 desserts. 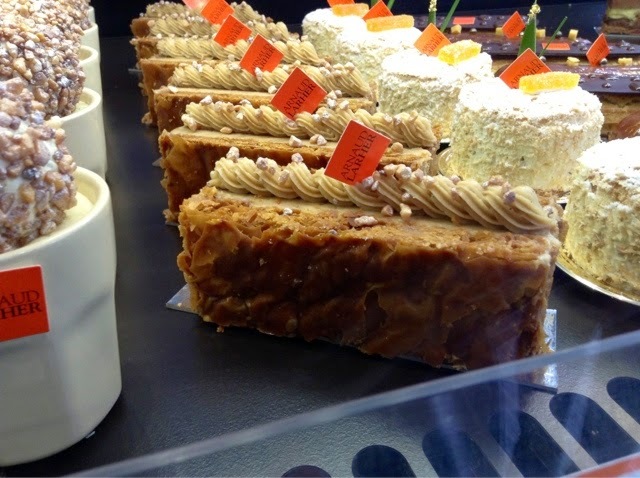 We may have to work our way through the whole collection like this sideways mille feuille. When you stop by do taste the passion fruit/mangue tartiner. Not easy to choose but since this was the last Ivoire left it helped us decide. An attitude of serious research is required. They were kind and cut our desserts perfectly in half. Inside Ivoire sitting on a base of coconut crust. 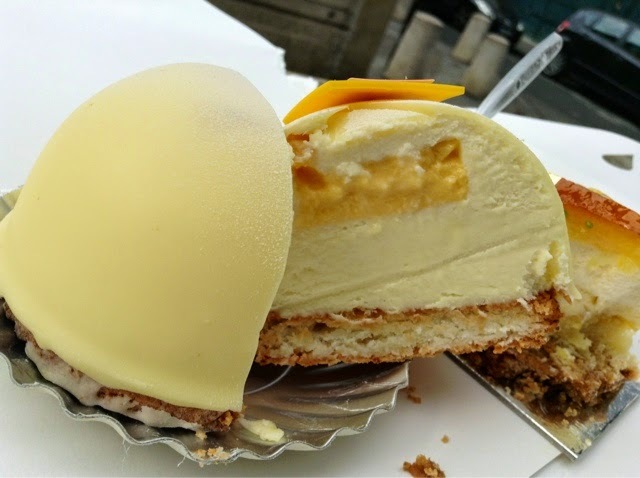 The outer shell and inner crème white chocolate with a touch of passion fruit and mango. Larher is a MOF from Brittany. 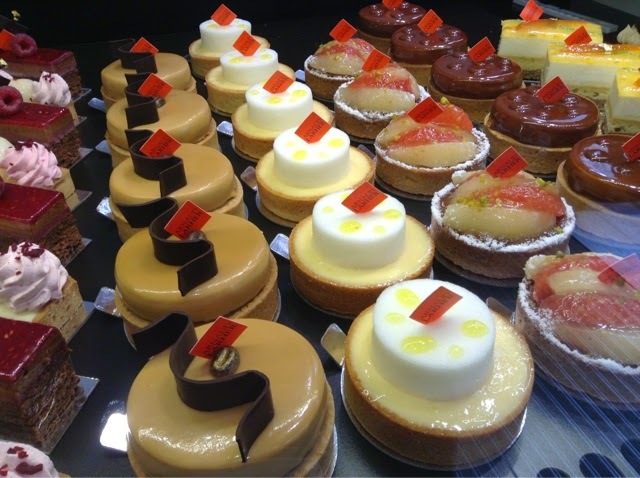 He worked with Pierre Herme and does a mean Koign Amann, yet loves to play with tropical flavors. 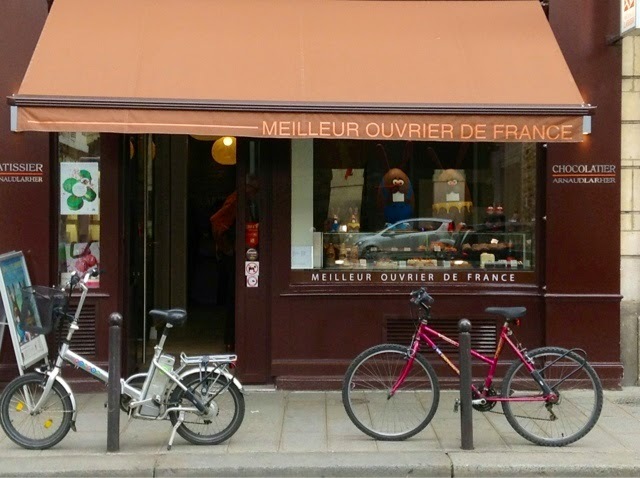 Our purpose was to pick up a Jour du macaron shopping bag for Coco Jobard. 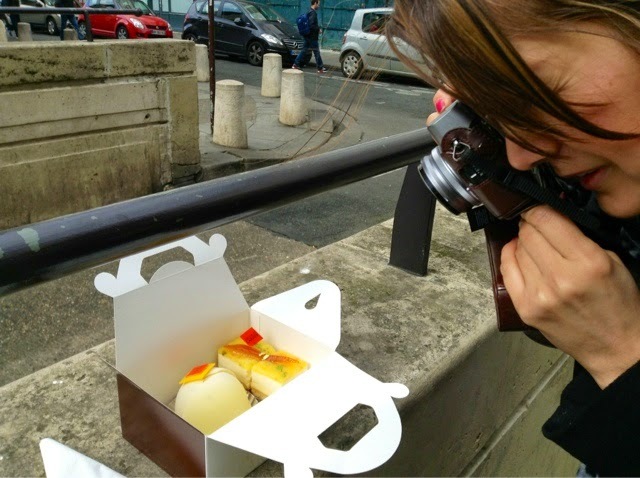 She styled this photo for Herme's latest macaron book and worked on the recipes, so it seems only right she should have the bag. 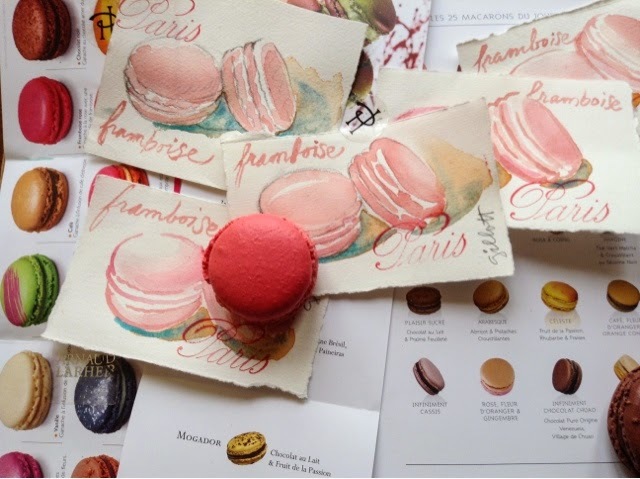 Still some macaron watercolors left for the taking on Etsy. 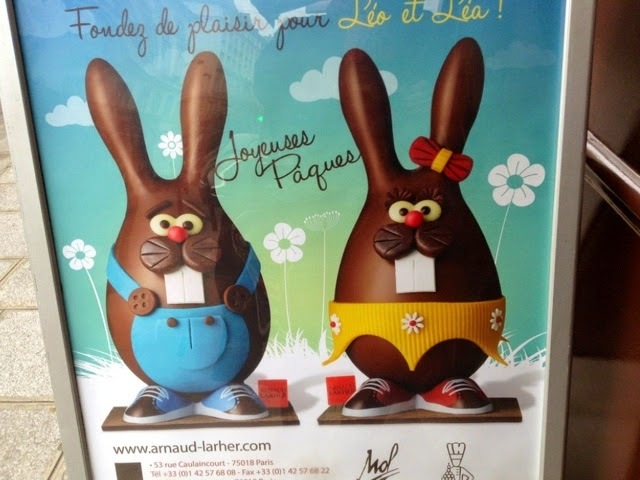 More Easter chocolate to come. I love Waterlogue..you know that. But it does not come close to you. I think I love it so much because I can't paint like you. 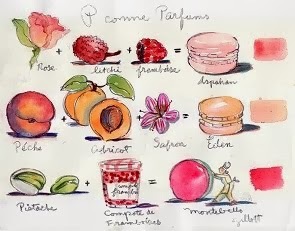 I miss your tutorials:) I happened upon "mes essais" last week. 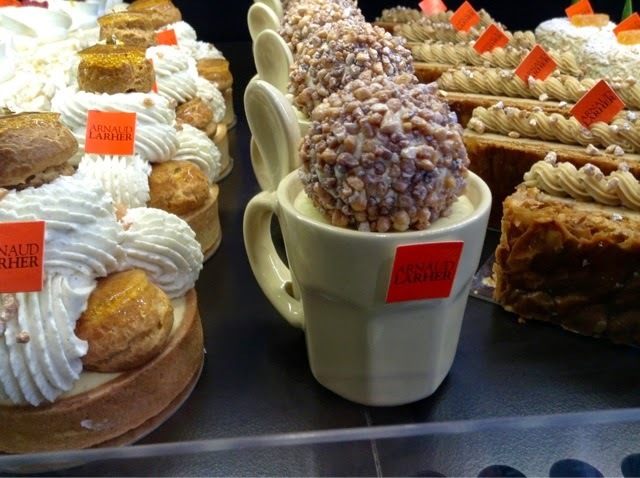 I Googled M.Arnaud..because I have heard his name and thought ..maybe on : Qui sera le prochain grand chef patissier? (Have no idea where the accents are on this laptop). But one of the desserts you highlight ..is in an article regarding him. I agree .only fitting she should have a bag. I wasn't making comparisons and it's fun watching Watwelogue 'build' the watercolor from line to shading. Something to be learned there. That's exactly why I bought it..Fun fun app . Good evening from New York. Carol I think that your watercolor paintings show just how ...ooh, shall we say artificial, are the results of that app. Yes, I have seen it in use in many places, and it's a fun effect. Still. Watercolor painting is more than an app. Now...on to those lovely sweets. Each of those on display looked tempting, but I do think that you all made excellent choices. Visual and tasting wise. Glad that you could acquire the sac for Coco, yet it seems rather stingy for her not being sent one. 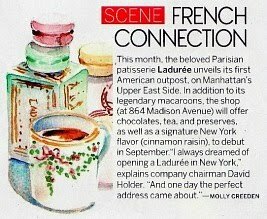 Have I mentioned to you that Repetto is going to open a shop on W. B'way next to Laduree? Bon Point on the other side of the pistachio green shop. Oooh la la. And still not a patch on Paris. 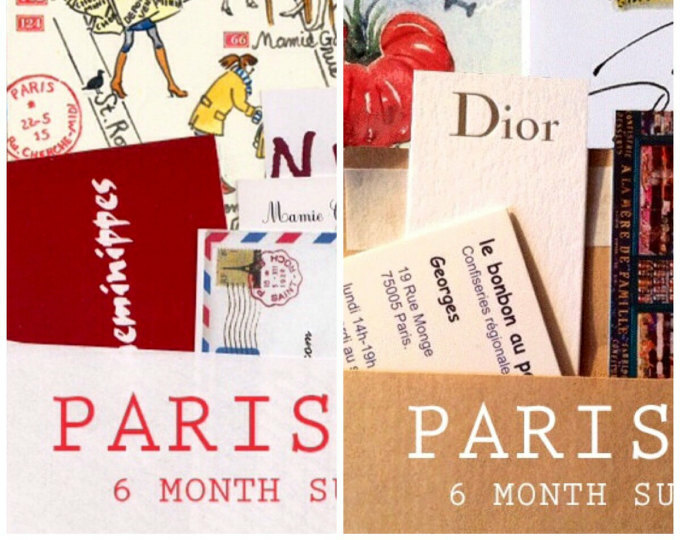 A 'Little Paris' for New York! Wow. It's a charity bag just 5€ so...better to give than not. I will load app onto my iPad. Yay! Coco's work is simply gorgeous! Oh my! what a choice I'd be driving everyone mad , dithering so long trying to make my mind up which one to choose. I've seen several people using waterlogue on their post. I had to look it up on Google search i didn't have a clue what it was.I had to ask my grandson what an app. was. You see, I don't have an Ipad or an Iphone. I think I'd love that waterlogue app.But it's got a long way to go to come anywhere near your fantastic style of painting. I'm still trying, some times I feel good about my paintings & other times I want to throw it in the bin. I Love your watercolors Barbara! Keep at it like the piano. Waterlogue is fun, yet it is daunting. It's impossible to duplicate in REAL watercolors. A thing on it's own. Grand kids these days know far more than we do!! Sweet treats and a tip on a watercolor ap? Great post. 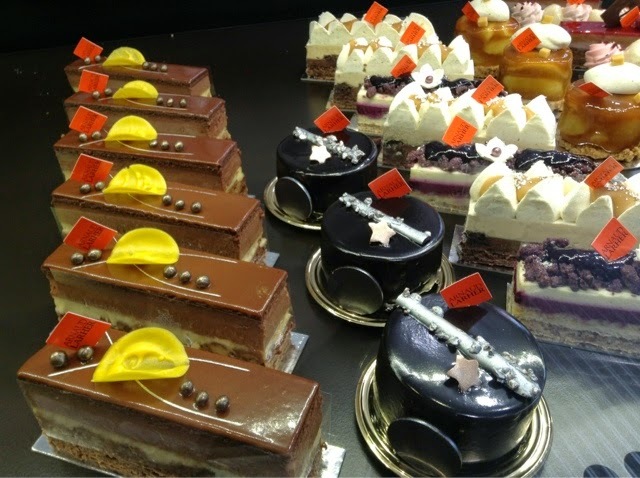 The pastries are so gorgeous - such care and perfection in each one. I love the consistency of the little square tag on each one. It is a tough job to taste your way through each one, but someone has to do it! Waterlogue - oui! Lots of fun, but none of the happy accidents - or apparent spontaneity of the real thing. And today's jackpot of desserts: just yummy! 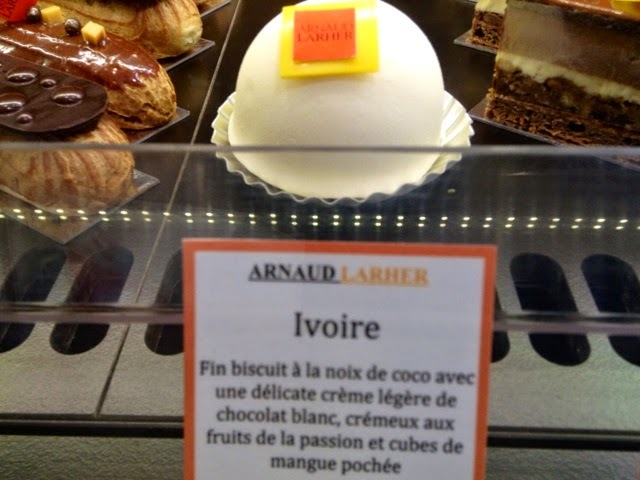 Mmmmm.....I would have chosen the "Ivoire," too. 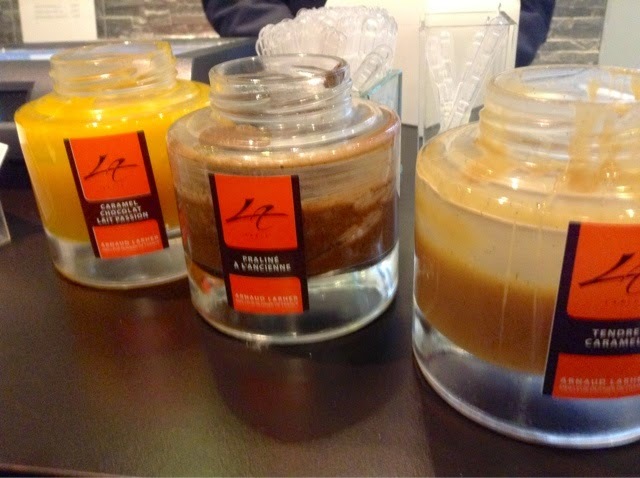 Yummy interior flavors, too. I am so hungry now!! 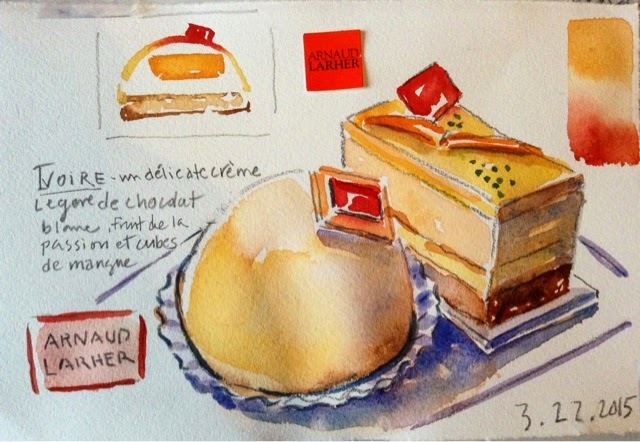 Those pastries are all works of art :) Beautiful quality photos and your watercolors (the app does a nice job, too!). They have very nice light in the shop and good glass cases so you get sharp pics. Lovely. I love Waterlogue, but I can't paint at all & it doesn't come close to yur watercolors. I used it on a picture of our Christmas tree for my Christmas card last year & it was fun. I also have four framed pictures from Paris that I used it on & have them sitting next to my computer to remind me of Paris when I'm not reading your blog. 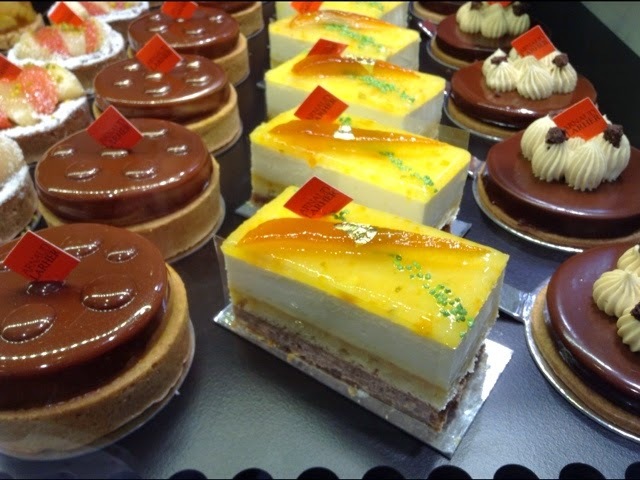 I'll take one of each of the pastries. Do they sell the bags all year, as I'd love to pick one up when I'm there? 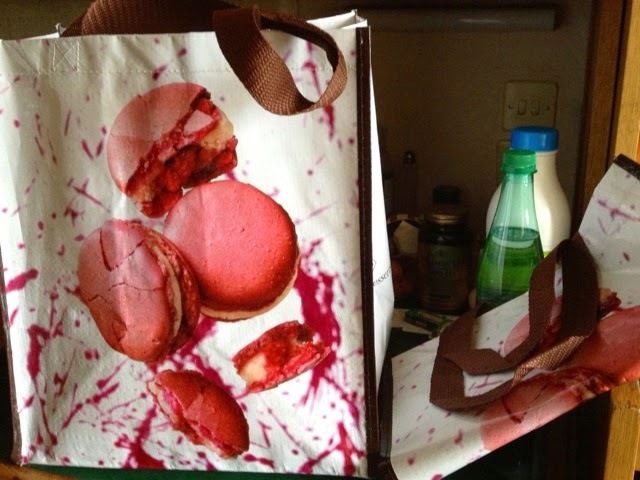 I think the macaron bag was just available during the Jour du Macaron event. I will check for you and others. This is beautiful!!!! I am so pleased to get PB!! hmmmmmm.......why am I hungry all of a sudden?? 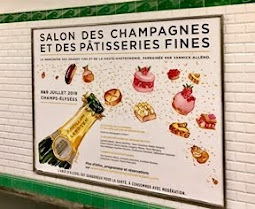 I'll take one of the meringues too! 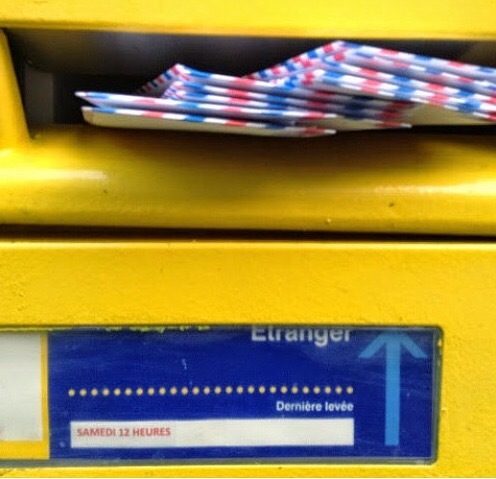 What a lovely post. We're flattered to be included amongst your wonderful photos and paintings!